We’re on the eve of the move and this is probably the last new facility update before actually moving in. Verizon is still missing in action, but we’re going ahead without them since it’s clear that it isn’t getting resolved anytime soon. We would like to thank Sprint for being patient with us since they were ready to hot cut back in August and we kept delaying to try to resolve things with Verizon. Final layout of a UPS and its battery cabinet before wiring. Three of these complete units will fit into our UPS electrical room (up to 4 supported) to act as one parallel redundant unit. 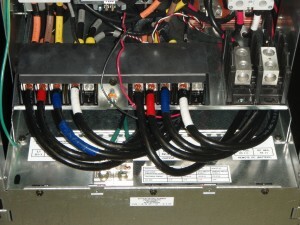 A close up of the UPS wiring. The cable is 1/0 AWG. 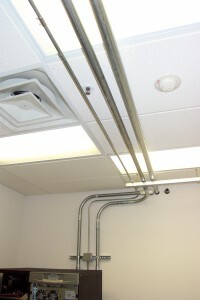 Some of the overhead piping in the UPS electrical room. 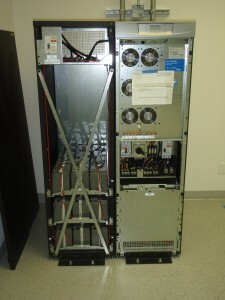 One of the two distribution panels for the server room (right) and the UPS paralleling panelboard (left). 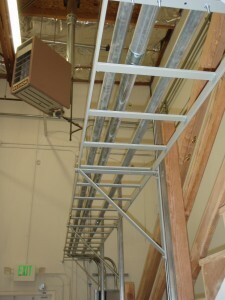 Overhead piping between the UPS electrical room to the panelboard that supports it. 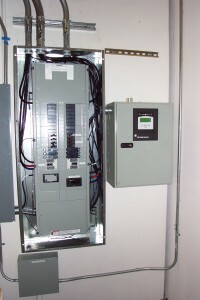 The panelboard is connected to our generator automatic transfer switch allowing it to be fed by utility power or generator power. As you can see, this is in the warehouse portion of the facility, which will house the generator. The original load center (left), the new panelboard for our stuff (middle), and our automatic generator transfer switch (right). 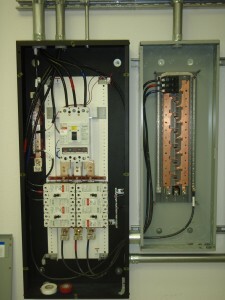 The panelboard with its dead front installed, wiring cleaned up, and the transfer switch after turning the power on for the first time. 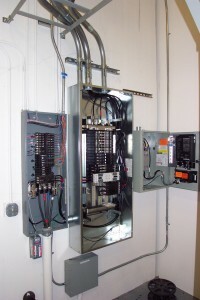 The generator will be installed within the week and piped to the connectors on top of the transfer switch. Wiring the generator is as simple as connecting it to the “emergency” contacts inside the transfer switch after the not so simple process of moving a very heavy diesel engine. The next update will be after the major move of circuits and equipment this weekend. There’s still plenty for us to do before we can consider it done and take a break, so stay tuned!